Kaikai Kiki Gallery is pleased to present an exhibition of Takashi Murakami prints, a media in which the artist has worked continually since the era of Kaikai Kiki’s predecessor The Hiropon Factory. Printmaking has always been important for Murakami, who fell in love with the practice during his time as a student. Despite occupying an important place in his own personal artistic story, this is the first time that an exhibition has been made composed entirely of these unique works. The range of items on display includes prints from Murakami’s time at Tokyo University Of The Arts, early pieces like HIROPON and the Mr. Dob series, the Louis Vuitton related “Superflat Monogram” series, and a series produced featuring the Murakami designed characters for Roppongi Hills “The Creatures from the Planet 66”. We will also be showing newer productions like Daruma and a recent series of abstract works. All in all, 80 individual prints will be exhibited. From lithographs to silk screens, each piece traces the developments in technique that occurred over the years, allowing for more and more elaborate artwork. We hope you will enjoy the unique universe that only prints can unfold. 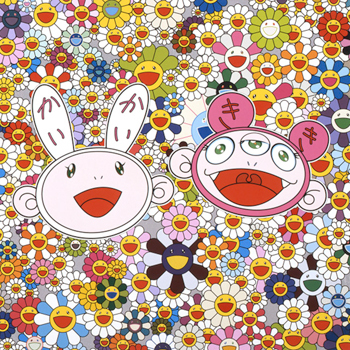 This exhibition is a follow up on last year’s highly successful poster exhibition and once again showcases an unexplored side of the internationally renowned artist Takashi Murakami. It’s also a rare chance for people inside Japan to see the artist’s works displayed domestically. A portion of the prints exhibited, including some newer works, will be available for purchase. Each print contains an edition number and the artist’s signature. In addition to the show at the Kaikai Kiki gallery, this exhibition is also scheduled to travel to Taiwan’s Taipei Salon in December. We hope you will consider coverage of this special event in your publication.